Every year some plonker or other crawls out of the wood work and proclaims that “we’re going to have a wonderful summer” or some such. This year was no exception – “we’re going to have a wonderful June”. Well, it’s summer and it’s June and thus far it hasn’t been wonderful. In fact, it’s been relatively cold. So much so that people have been lighting fires and running their very expensive central heating. Be that as it may, we’ve just had a very pleasant (i.e. dry and largely sunny) week exploring East Sussex. One reason we went was to ramble along some of the South Downs Way, a 100-mile national trail running between Eastbourne and Winchester. Being at the Eastbourne end, we limited our first foray to the stunning white cliffs of the Beachy Head and Seven Sisters coastal stretch. 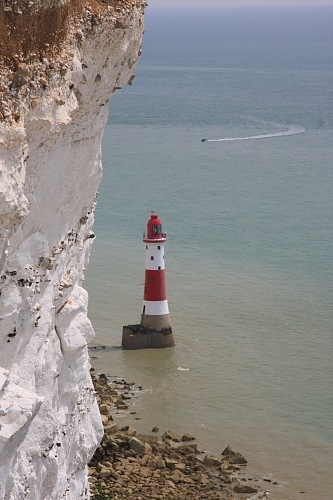 I don’t recall ever seeing Beachy Head before but I was immediately impressed; so much so that I think the Cornish coastal path has a rival for my affections. The skies cleared, the sun shone and made the white cliffs glow against a brilliant blue English Channel that began to resemble the Mediterranean. The lighthouse, now at sea level because the high original was too often shrouded in mist, is utterly dwarfed by the towering cliffs. 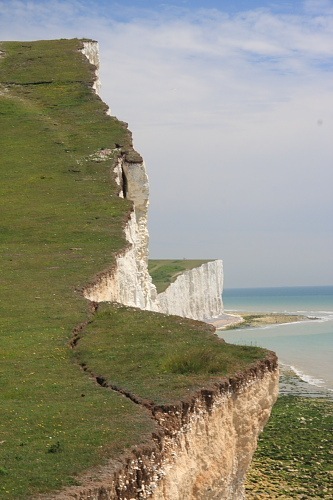 The structure of the cliffs was particularly fascinating with relatively evenly-spaced layers of flint interspersed with the white layers of chalk. 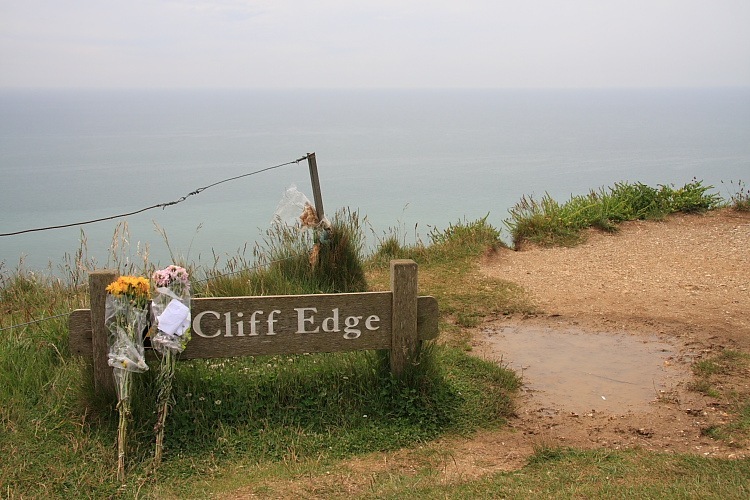 The darker side of Beachy Head is that it seems to have become the national suicide centre. It recently made headlines when a young couple, having lost their 5 year old child, jumped to their deaths together with their sadly departed child’s body in a rucksack. This happened while we were in Corfu and we heard about it even over there. 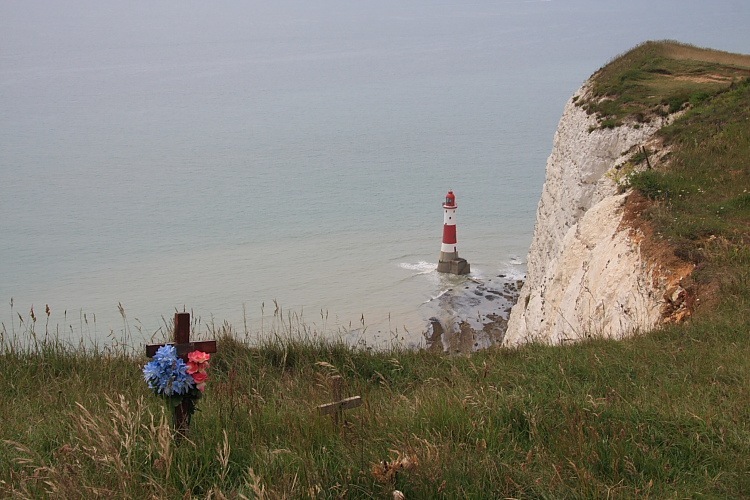 I didn’t realize how popular a pastime jumping off Beachy Head had become until we walked along its coast and saw many floral tributes to those that had chosen to end their torment in the same way. 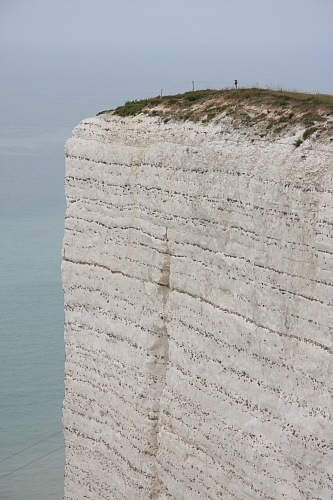 It’s so popular that, in addition to the Samaritans, there is even a Beachy Head Chaplaincy. On a brighter note, a couple of miles west of Beachy Bead, the South Downs Way crosses the undulating landscape of the Seven Sisters. 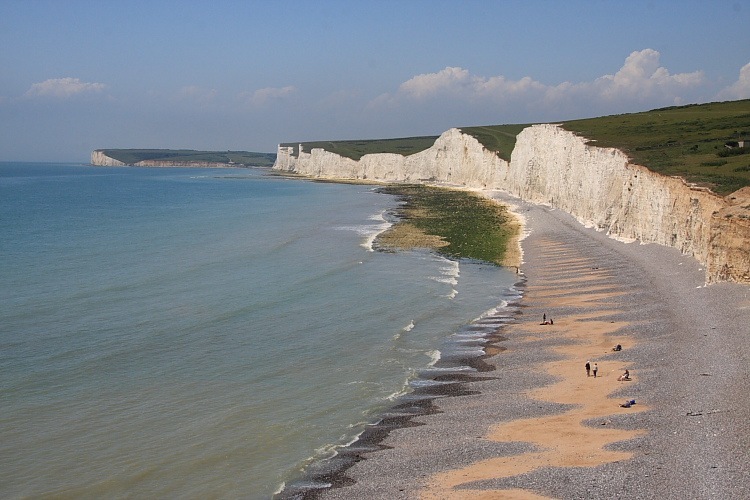 The Seven Sisters are seven valleys of varying severity descending towards the white cliffs of the coastline. There is absolutely nothing flat here, you’re either walking up or down, and noticeably strenuous it is, too. The sight of the white cliffs, including chunks that are clearly about to break away, makes the effort worthwhile though. Since we tend to do walks that are “there and back again” (very J R R Tolkien), we had to walk 14 sisters rather than seven. Our walking legs were swapped for cycling legs so we could spend a day on the second main draw to Sussex, rummaging around various graveyards looking for Curd headstones. My family hailed from this part of the world (Buxted, Maresfield) in the nineteenth century and I was hoping to see the grave of my great great grandfather. No such luck, I’m afraid, though Carol did spot what turned out to be the grave of one of his brothers, a great great granduncle I suppose. Many graves are without headstones and even more are illegible so, who knows, we may have walked right by it without knowing. In some respects, East Sussex seems to be like England in miniature. Apart from archetypical quaint English villages, it has an area of “levels” very similar but much smaller than the Somerset levels. There is also Ashdown Forest, which is not unlike a much more compact New Forest. Not being a literary buff, I was totally unaware that Ashdown Forest was home to A A Milne and birthplace of Winnie the Pooh. The forest provides maps indicating “Eeyore’s gloomy place”, “an enchanted place” and, almost a Holy Grail, the original “Pooh Bridge” where the game of Pooh Sticks was developed. 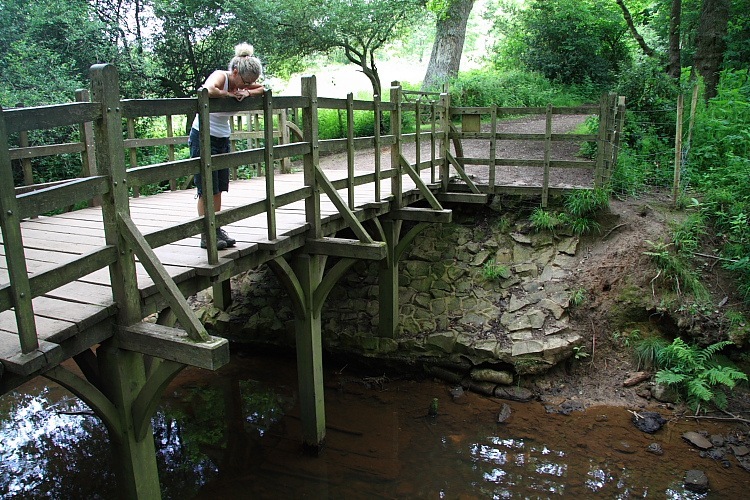 Naturally, we had a personal pilgrimage to Pooh Bridge for my inaugural game of Pooh Sticks. I lost but then I am a complete novice. Finally we spent a day on a much flatter but windier cycle ride to Hastings and back. The 12 miles there was dead easy being wind-assisted. Returning was a different matter as we now had to battle into a fierce headwind. 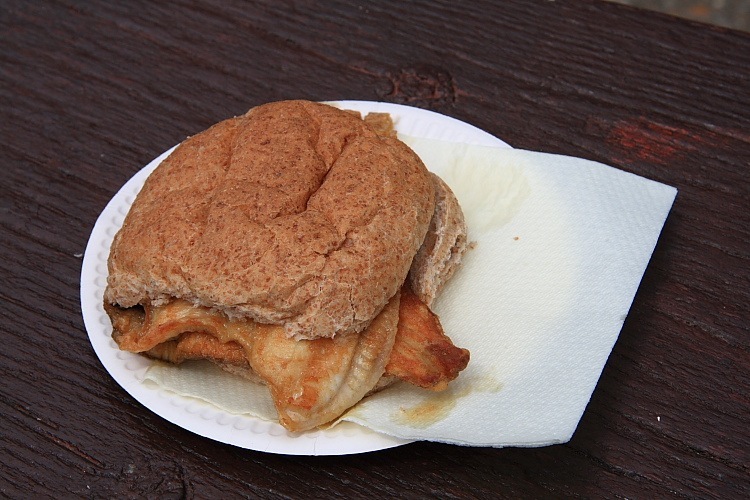 Fortunately we had been fortified by a wonderful Fisherman’s Roll, a bread roll filled with two fillets of extremely fresh, locally caught plaice fried in olive oil, and all for the princely sum of £2. What a deal! They were absolutely delicious. No wonder the eminent Mr Stein was a fan. Also fortunately, Carol’s bike waited until we were within 200 yards from our car before getting a puncture. If a flat tyre can ever be called lucky, this one could. I’m pretty sure we’ll be back.